This is another family sized hammocks but with a particularly feminine feel. The Rio utilizes the Jacquard weaving method, producing a softer and more comfortable hammock material. Finished with a hand woven hem on each side, beautifully made macrame border frames this feature for your garden. The noble Rio is a veritable gem and is stable enough for the whole family thanks to its high-quality cotton and tight weave. Gala: This is a metal frame made from powder-coated steel. A tall curved and polished stainless steel water feature, the Hudson Moonscape. Optional bowls available to create free-standing feature. 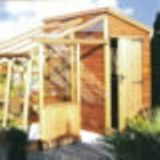 Lean-to Greenhouse 6'x8' from the Growhouse range, ideal for attaching to a house or wall. Featuring one roof vent and one side vent. 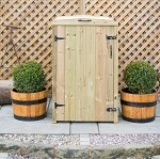 Designed for bird watching at a Primary School, this hand made Bird Watching Shed measures 12'x6' (3.66mx1.83m). Featuring two hatches, ledge and free standing benches.